Same as Belarus, Estonia also issues 'Bird of the year' in each issue year. Thanks Piro again she sent me the first day cover in this year, it makes my series not be suspended. 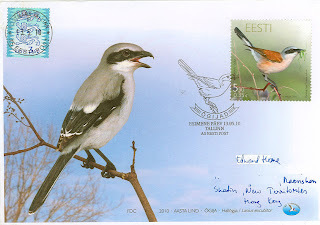 This year, Estonia Post selected Red-backed Shrike and Grey-backed Shrike (灰背伯勞) to be actors, however the stamp only shown Red-backed Shrike and other one only appears on the first day cover. Shrikes are beautiful birds with long-tail, the family widely to be found in Eurasia, Africa and North America, most of shrikes are catching insect, small manuals and small birds as their diet. Above two species, Red-backed Shrike and Grey-backed Shrike, are commonly inhabit and breed in Eurasian area, they will migrate to sub-Sahara area for winter.